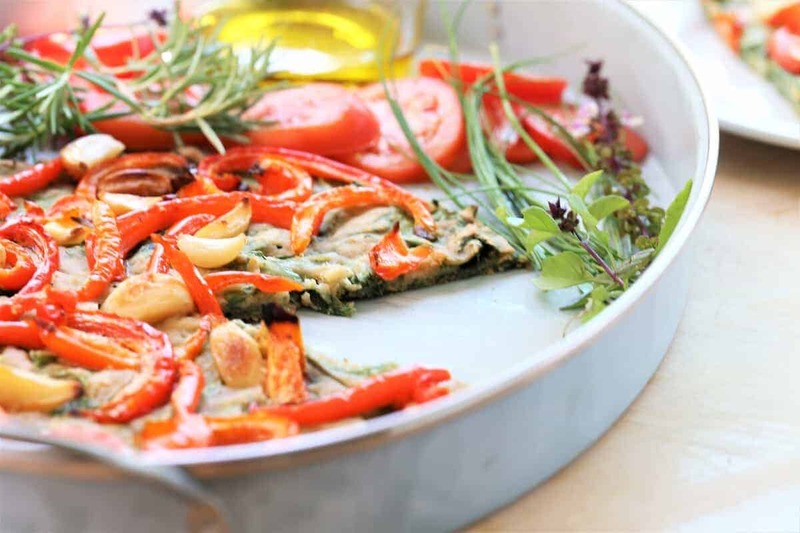 Vegetable pizza bread with herbs, greens, onions, red pepper, garlic. Yum. In the prime of summer, all of my home grown herbs and tomatoes are ripe for picking. 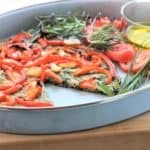 There is only one food that allows me to use all of these goodies–Vegetable Pizza Bread With Herbs. This dish is a simple gluten free bread with greens and onions, and topped with roasted red pepper and garlic. I suggest that you serve with an array of herbs to choose from, so that you can add the flavors that you love the most. For me, basil is the best herb with pizza or pizza bread, but there are many others. 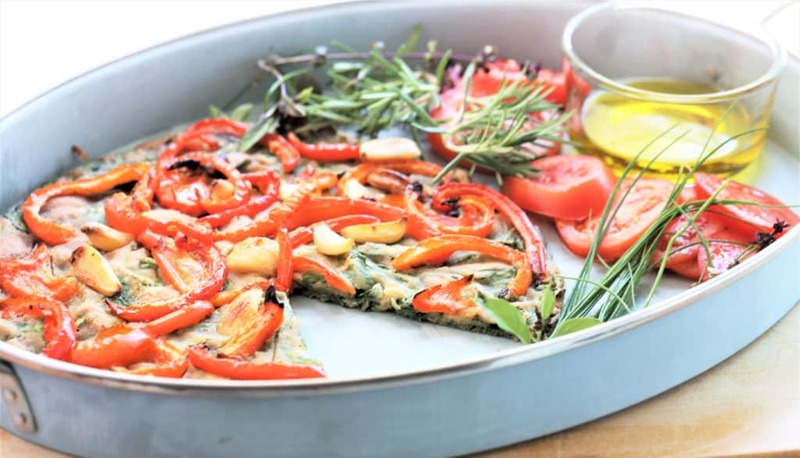 Healthy and tasty, this vegetable pizza bread is vegan, gluten free and dairy free. Rub olive oil on bottom and sides of pan. I used a shallow 10" fluted tart pan so that I could easily get the bread out, but use whatever pan you have that has sides. (Not flat pizza pan). Bake at 350 for 40 minutes. If you would like it crisper, bake an additional 5 minutes at 375. 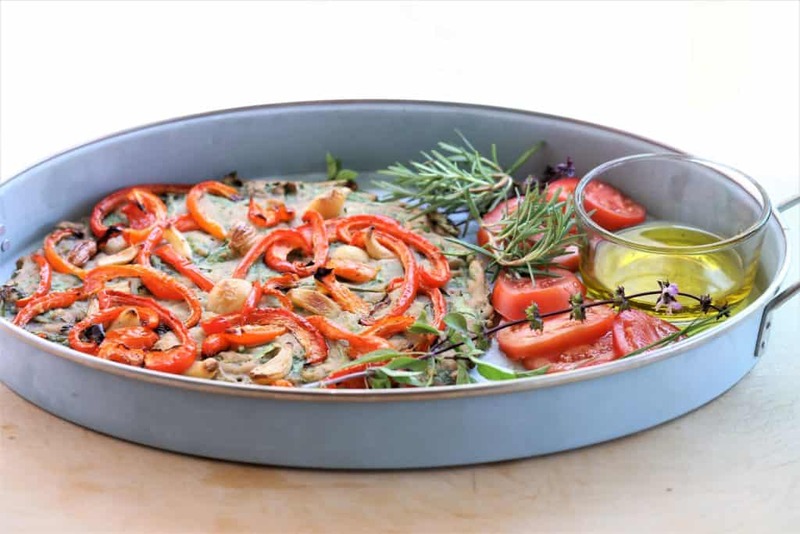 Place red pepper and garlic on baking sheet. Drizzle with olive oil, sprinkle, salt, pepper and garlic. Bake 30 minutes at 350 degrees. If you would like them crisper, bake an additional 5 minutes at 375. After pizza bread is done, top with peppers and garlic. Garnish with basil, rosemary, chives or your favorite herbs.